Gayety&apos;s - These treats are neat! Fellas, Valentine&apos;s Day is today and some of us have important decisions to make such as, "Where are we going after dinner?" or "Should I bring chocolates?" Both are fair questions but look no further. I know where you should plan to go after dinner, and yes...of course you&apos;ll have chocolates. The solution is visiting Gayety&apos;s in Schererville, IN or Lansing, IL. I&apos;m sure you&apos;ve heard the old saying, "It&apos;s like a kid in a candy store," right? Well, it is way better to be adults in a candy store. For one, you can splurge all you want on candy and no one can tell you no. Let&apos;s face it, chocolate is an absolute must for Valentine&apos;s Day. Just imagine hand-dipped chocolates, homemade ice cream and toppings, chocolate drizzled strawberry-kabobs and even orange peels dipped in chocolate. Gayety&apos;s is without a doubt the perfect place to start or end your Valentine&apos;s Day. We in the region are lucky. Over the weekend, Gayety&apos;s held a grand re-opening at their Schererville location. Now in the hands of third-generation family members, Jim and Beth Flessor are treating us to the sweetest and most mouthwatering chocolates in town. 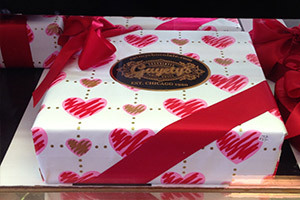 There&apos;s something about their handmade chocolates and homemade ice cream that makes Gayety&apos;s stand leagues above others. Simply stated, it&apos;s the taste. You can taste the quality and care that is placed within each and every hand-dipped piece. Each bite of ice cream makes your mouth swirl with these flavors that you can&apos;t find with your national vendors. Now fellas, let&apos;s play out a situation and see how it unfolds. You&apos;re about to leave to pick up your date for Valentine&apos;s. You&apos;re suited up, shoes are shined, and you are looking good. I mean, you&apos;re surprised that mirror hasn&apos;t shattered yet. Go ahead and even add a dab of cologne, you&apos;ve earned it. Maybe you bought some flowers, too. Great, bring those because you definitely don&apos;t want to show up empty handed. But wait, you have two hands! If you only hold flowers in one hand, what could that other hand possibly be doing when you stand at the door? Are you saving it to knock? To be honest, that sounds foolish. That&apos;s why we have knees! Easy now...don&apos;t panic. Collect your thoughts and we&apos;ll work through this. What typically comes in heart shaped boxes, wrapped in bows, and are usually mixed in some sort of an assortment? Yes! Chocolates! Not just any chocolates though. A candy bar from a gas station won&apos;t do. No, we need something that invokes emotion; a call to the senses! We need a chocolate that leaves your taste buds singing with flavor like from the choir of Ah-mazing. The answer is Gayety&apos;s. It&apos;s simple, sweet and trust me, it makes a difference. Whew, crisis averted. I&apos;m glad you&apos;re reconsidering after that whirlwind we just went through. We discovered what your Valentine&apos;s Day needs to include. It needs chocolate, or ice cream. Not just any old bargain brand bar, but Gayety&apos;s. You can get creative there, too. Maybe try out more than chocolates. 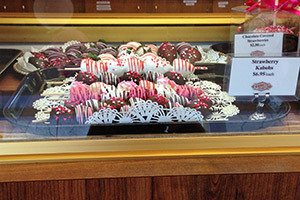 Gayety&apos;s also offers Designer Desserts cupcakes, chocolate pretzels and gourmet popcorn. Jim and Beth Flessor run an amazing store and are the kindest people in the chocolate game. 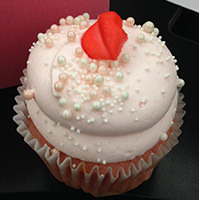 With locations in Lansing and Schererville, do you and your date a favor by making Gayety&apos;s your go-to for Valentine&apos;s Day treats.